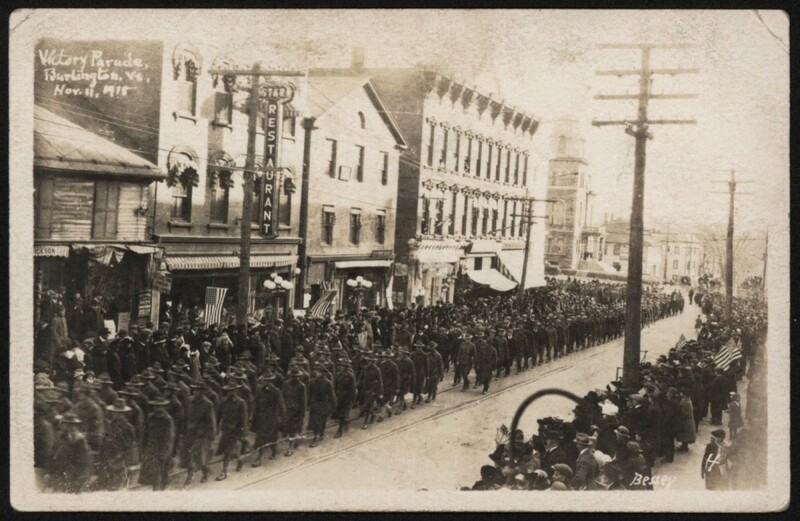 Ninety-six years ago, on November 11, 1918, a victory parade was held in downtown Burlington to mark the end of World War I. This postcard from Champlain’s Llewellyn Collection of Vermont History commemorates the moment when crowds gathered to watch soldiers march up Church Street. The following year, November 11 would become a national holiday honoring veterans, now known as Veterans Day. C.H. Bessey, the photographer who took this image, was probably standing in an upper-story window of what was then the Ethan Allen Fire House, now the Firehouse Gallery for Burlington City Arts. He aimed his camera down Church Street towards its intersection with Main Street. The three-story building on the corner with the flat roof, the 1876-1877 Exchange Block at 150-154 Church Street, remains standing. This entry was posted in Special Collections on November 10, 2014 by Daniel Selicaro.